The first month of 2018 has come to a close. 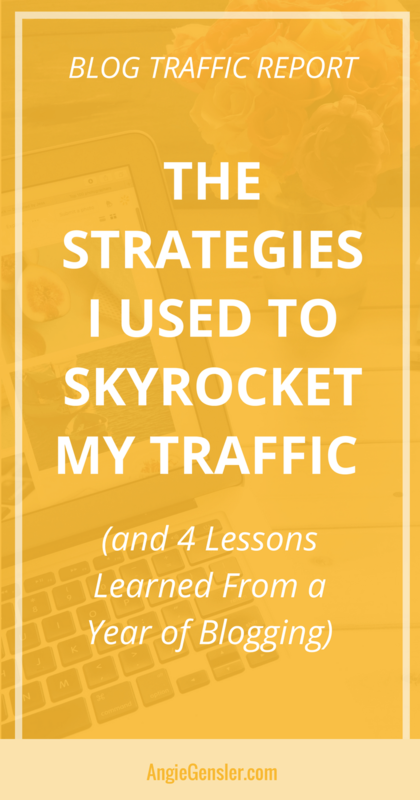 It’s hard to believe that just one year ago I was writing my very first website traffic report, Tips and tools that generated 5,344 page views my first month blogging. 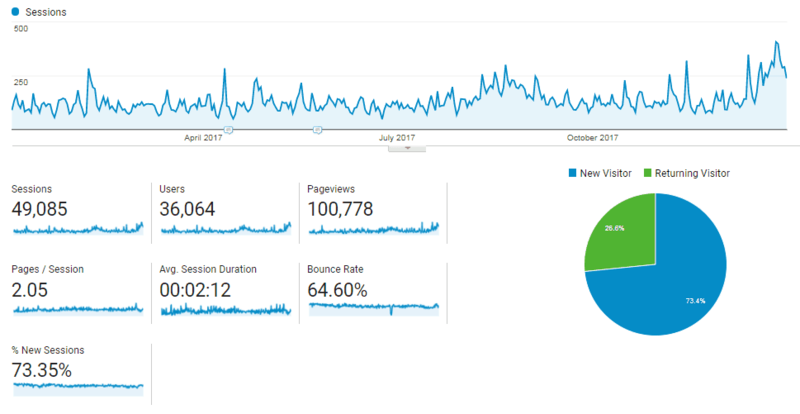 A lot has happened since that first website traffic report so I’m going to begin this post with an overview of 2017 – including my goals, milestones achieved, and lessons learned. Then, I’ll dive into January 2018 and share my traffic strategies and results. This is a long post full of value so be sure to Pin this article or bookmark it if you don’t have time to read it all in one sitting. Trevor and I launched my blog on December 16, 2016, which means January of 2017 was my first full month of blogging. Those first few days after we launched blew our minds and exceeded all of our expectations. We set a goal to get 100 email subscribers by July and we got them in the first 10 days! By July, we had over 3,000 subscribers. It was unbelievable. To learn how we did this read: How to Go From 0 – 500 Email Subscribers in 30 Days. We had a lot of ups and downs throughout the year and learned a lot. We published a total of 29 blog posts, sent 27 emails, and created 41 videos. Those numbers would have been higher, but I took a five-month break to create an introductory Pinterest course and dabble in consulting. I pursued the consulting route very heavily until I realized I didn’t enjoy the work or find it fulfilling. I would give all my energy to my clients, only to see them implement a fraction of my suggestions and then not see results. I no longer felt like I was making a difference and helping others. I felt like a high-paid distraction. Even though the consulting detour caused my activity with the blog to slow down, it gave me the clarity I needed to define exactly who I want to help and how. In October, I began to redesign my brand and focus my content on serving new bloggers and small business owners. The rebrand has also forced us to make a lot of changes to the website, including our blog post format and calls-to-action. We removed the right side-bar and simplified the footer which removed a lot of clutter. 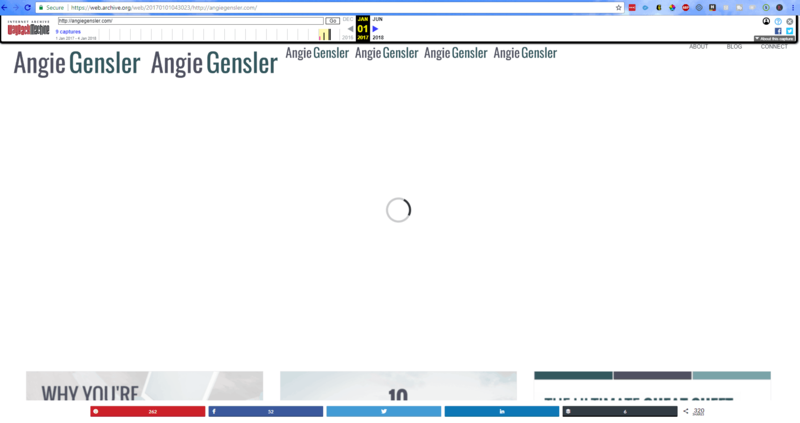 We also added parallax scrolling bars for our calls-to-action. The bars help our CTAs stand out and they have increased our opt-in conversion rate. We were only a few subscribers away from adding 1,000 new people on our list last month. 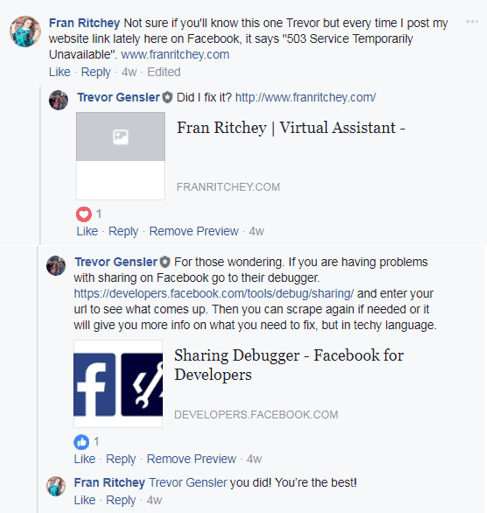 Another awesome change we made was to get Trevor more involved with the blog content and my private Facebook group. Up until September, he played a behind-the-scenes role building and managing the blog. Through consulting work of his own, he discovered a passion for teaching others and saw a huge need to share his knowledge with others. Take a look at a recent issue he was able to solve for a member of my Facebook group, Team of One Biz Owner. Trevor now writes and coaches my readers on how to blog and manage the technical aspects of blogging and I focus on how to drive traffic and monetize a blog. Check out the numbers our teamwork generated in 2017. Social media drove 54% of my blog traffic with Pinterest making up 80% of that number. Pinterest drove nearly 18,000 people to my blog last year. Facebook came in at a distant second with 15% of the social media traffic and Twitter, YouTube, Instagram, and StumbleUpon making up the remaining 5%. Trevor and I did a deep-dive analysis near the end of 2017 and decided that we’re going to focus our traffic-driving energy toward search engines. This means Pinterest, YouTube, and Google – that’s it. No more stressing about Instagram posts or engaging on Twitter. Twitter and Instagram require a TON of time and attention and the two platforms combined brought less than 500 people to my blog last year. To put that number in perspective, Pinterest brought me the same amount of people in three days as Twitter and Instagram brought me all year! Our decision to focus on search engines caused Trevor to go deep into the world of SEO and keyword research. Take a look at the screenshot below of our January 2018 traffic versus the prior year. It’s insane to see that we hit almost ¼ of the pageviews in one month as we hit all year last year. We’re off to a great start and our focused efforts have already made a significant difference. 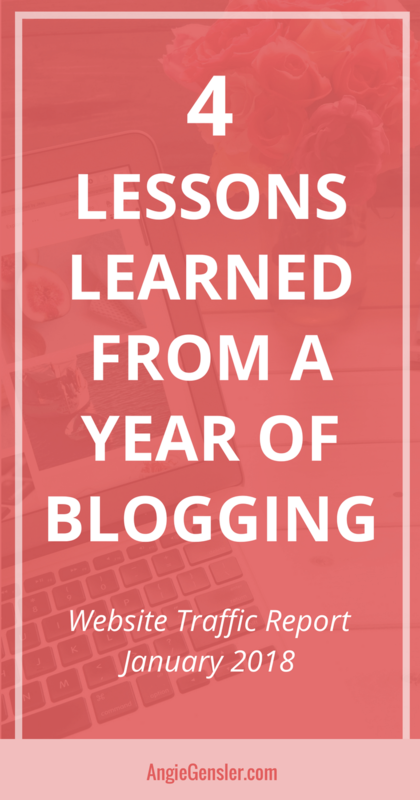 Before I share our January traffic strategies in more detail, I want to share four major lessons we learned from a year of blogging. Over the last year, Trevor and I have exploded with knowledge and experience. Even though I have over 10 years of professional marketing experience, an MBA, and over five years of experience as a business owner – I still have a lot to learn. The most noticeable improvement we made throughout the year was the design quality of our blog and social media images. A visit to the waybackmachine will show you what the site looked like on launch day. Yikes! What a hot mess. The first capture from the Wayback Machine happened to catch a time when we were experiencing issues with the logo and load-time with our header image. Those issues persisted until we switched our hosting over to SiteGround. Now take a look at the progression of our Pinterest pin designs. I’m not gonna lie. It’s pretty embarrassing to share those images, but I think it’s important to show the transformation we’ve made over the past year. It’s a perfect example of our mantra – perseverance, not perfection, is the key to success. If you’re just starting out and you’re not completely in love with your design or branding DO NOT let it hold up your progress. The beauty of a blog is you can easily make changes to it at any time. It’s not like a billboard or a television commercial. If we would have waited a year until we stumbled upon a brand identity we loved not only would we have not made any progress, but the thousands of people we helped this year would have never found the answers they needed. Prior to starting this blog, all of our marketing and business experience revolved around selling high ticket services. I’m talking anywhere from $500 to $10 million per sale. High-ticket transactions take a long time and require a detailed sales cycle. I attempted to build a very detailed and long email sales funnel to promote Pinterest 101 course. Oh, boy was that a flop! I built a series of free educational emails that led the subscriber to another series of free educational emails. By the time I shared the course, they were 10 emails deep and beyond overwhelmed. That’s a bit ridiculous just to sell a low dollar training. In December, Trevor and I launched my 2018 Social Media Content Calendar and designed a very simple sales funnel. We promoted the calendar through four different blog posts. The blog posts each contained a call-to-action to download my cheat sheet of what to post on social media. Once they opted-in to download the cheat sheet, a thank-you page with a $9 offer would appear. Then, they would receive a series of four emails that all provided value as well as continue to pitch that same offer, but now for $24. Instead of making the pitch after 10 emails, we made the pitch immediately after getting the email address and then again for the next four emails. And you know what? It worked like gangbusters! This may sound silly but, trust me, it’s terrifying to send your first email and see your subscriber count drop and get your first spam report. We received our first spam report on my birthday last year and I was devastated. It was really tempting to never email again or only email once a month. After digging into my data I realized I received that spam report because I hadn’t emailed that person in over two months. To avoid spam reports and unsubscribes you need to email often. Otherwise, people will forget who you are and be annoyed that you’re cluttering up their inbox. Another reason to email often is that it drives traffic to your site. Each time I send an email I see a huge spike in traffic and an increase in sales for the next 48 hours. (More about this later). As I mentioned above, I took a five-month detour to dabble in consulting. The consulting detour showed us that it’s OK to take a break. 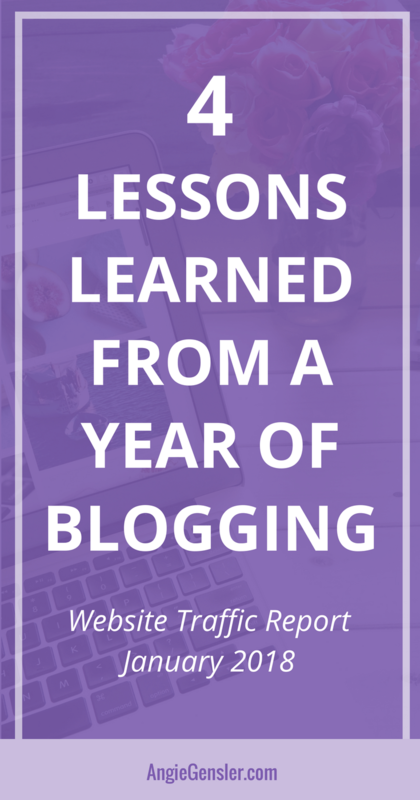 Consistency is not the be-all and end-all of blogging. Don’t get me wrong, consistently publishing content is important to growing your blog, but contrary to what all the “experts” teach, taking a break will NOT kill your blog. The screenshot below proves it. I was publishing weekly content up until May 12, 2017. After that, I published one post in June, one post in August, and nothing again until November. Strangely enough, my traffic remained level through June and then started to grow in July. Trevor discovered that around July our SEO efforts began to take hold and produce some decent organic traffic for us. I published another post in August and then the traffic dropped back down where it was in April. Still, not bad for only having published two posts during that time. We started our weekly posts back up in November and our traffic immediately started to skyrocket and hasn’t slowed down since. Our traffic levels remained consistent throughout a five-month publishing hiatus and it bounced back bigger than ever the first month we began posting again. Blogging doesn’t have to be all about the hustle. I’m living proof that it’s possible to build a blog while raising a family and maintaining a full-time job. I still get 7 – 8 hours of sleep each night and I’m able to spend lots of quality time with my family and friends. Obviously, this means I can’t build my blog as fast as I would like, but I’d rather build a sustainable business that fills me with joy and energy. Personally, I don’t think a business is worth building if the expense is my health and happiness. Bottom line: Don’t let blogging stress you out or ruin your sanity. Your blog is meant to be a joyous creation – not an exhausting hustle. If you want to learn more about these four lessons, watch the Live video I did to my private Facebook Group. Something really funny happens at the 13-minute mark. Well, funny now. At the time it completely freaked me out! Now that you’ve learned from our first year of blogging, it’s time to dive into our first month of 2018. 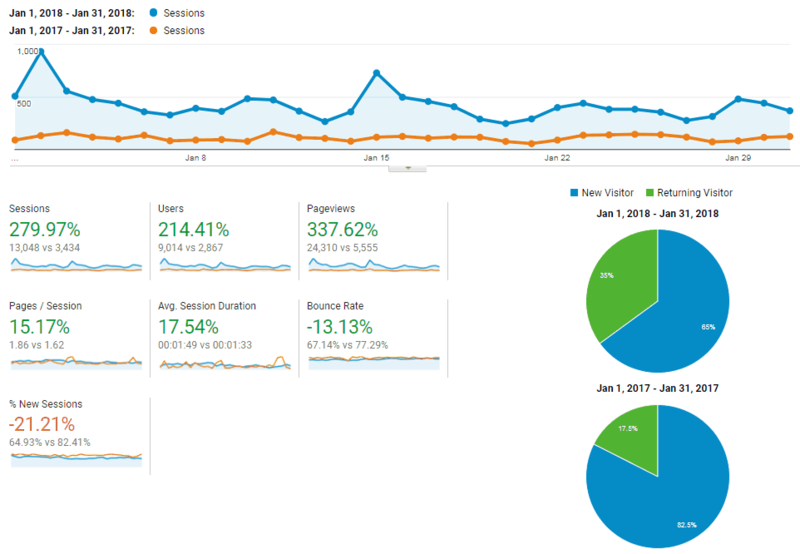 I’m going to share our goals and traffic strategies from January and our plans for the next few months. Trevor and I have set many new goals for 2018 including, make a billion dollars and take over the world. Ok, not really. Our goals this year are more focused on what we want to create and less about what we want to receive or achieve. We want to create some amazing courses this year to help you build your blog and grow your business. I’m working on a comprehensive Pinterest course for bloggers. The course will walk you through how to build your account, how to design viral pins, how to build a Pinterest sales funnel, and my top three traffic strategies for Pinterest. I plan to release the course in phases and anyone who has purchased one of the phases will receive access to the entire course once it’s ready. This includes anyone who has purchased my current mini-course: Pinterest 101: Foundation for Growth Course. Trevor is working on a comprehensive blogging course. The course will walk you through step-by-step how to start a WordPress blog, how to create, publish, and promote blog content, how to capture leads, and how to monetize your blog. Trevor is also going to release this course in phases – the first of which will be an SEO for Bloggers mini-course. If you want to learn how to create perpetual traffic to your website, you need to take the SEO course. In addition to course creation, Trevor has been hard at work redesigning the entire website onto Divi by Elegant Themes. This is no easy task for a single person to redesign a website that is already established. He has to go through every single page, blog post, landing page, and sales page we have created over the last 14 months and redesign it. This process will occur slowly throughout the year as he finds little pockets of time to work on it. You may be wondering why we don’t have very specific number goals. Naturally, we would love to hit a certain number of emails subscribers, page views, and sales, but focusing on the numbers just causes us to work until exhaustion. Work-life balance is very important to us. We’re not interested in hustling to hit our goals at all costs and we want to show our readers it’s possible to build a profitable blog with joy and ease. In fact, we’re so serious about maintaining the balance between living your life and building your blog that we bought the domain name bloglifebalance.com. We’re not completely sure what we’re going to do with it yet, but it’s part of the master plan. In January I published two new blog posts and focused heavily on promoting four posts all related to social media marketing. All four posts included calls-to-action to download free content which generated nearly 1,000 new subscribers in January. In December, I launched my 2018 Social Media Content Calendar which is 365 days of social media post ideas. We learned our lesson from our last product launch and created a super simple sales funnel for the calendar. I wrote an epic blog post (What to Post on Social Media in 2018) and created an irresistible lead magnet (50 Social Media Content Ideas). When a reader submits their email address to receive the lead magnet, they are immediately sent to a page offering the calendar at a one-time discounted rate. That page converted extremely well. I also created a series of four emails that provide additional value and continue to pitch the calendar. Those emails also generated a lot of sales last month. Obviously, the sales are awesome. But even more exciting is knowing that I’ve helped hundreds of people! It warms my heart each time I receive a positive comment or email about the calendar. I have other products and services available, but the Social Media Content Calendar was my primary focus last month. Last month I sent five emails to my subscribers. Remember earlier when I said to email often so you stay top of mind with your subscribers? Another great reason to email often is to drive more traffic to your website. Each red arrow indicates when I sent an email. Notice how each email corresponds with a spike in traffic. In addition to spikes in traffic, I also saw a huge spike in sales of my Content Calendar. I now understand why some people get addicted to sending emails! Now let’s talk traffic and strategy for January 2018. Below is a screenshot of my traffic from January and a breakdown of the numbers. As I mentioned earlier, Trevor and I are now placing our time and energy generating traffic from search engines. This means Pinterest, YouTube, and Google. We also invested a fair amount of money last month to test Facebook ads and Pinterest promoted pins. Let’s start with Pinterest since it continues to generate the bulk of my traffic. I utilized three methods to drive traffic to my website – Pinterest group boards, Tailwind Tribes and Promoted Pins. 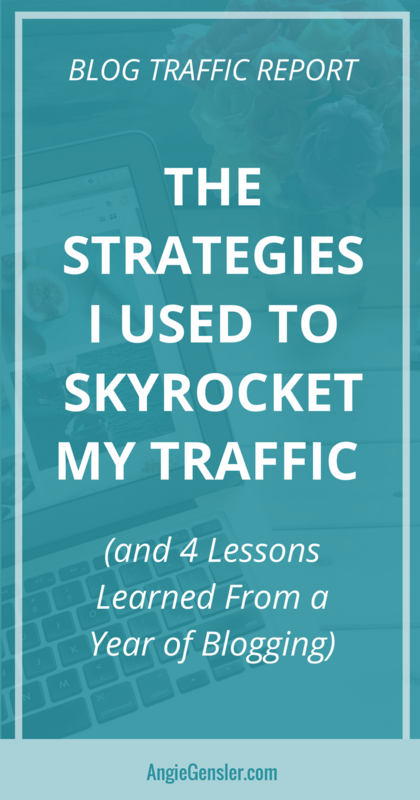 This traffic trifecta worked so well that I plan to create a free webinar sharing how it works. I’ll release it to my email subscribers so make sure you’re on my list. In addition to my traffic trifecta, we also focused on optimizing my Pinterest boards. Trevor conducted a competitor analysis and a thorough SEO audit and I studied the data in my Tailwind Board Insights. We used the data to create a master plan for my boards and we’re in the process of making small changes and updating board topics. I also created two new group boards and am now accepting contributors. One board is specific to social media marketing and the other is open to all bloggers to promote one another’s content. If you’re interested in joining one of the boards click the links below and follow the directions in the board description. Trevor focused more time last month digging deep into the world of YouTube and using what he learned to optimize my videos. Since then, we’ve seen a noticeable increase in our video views and subscribers. As you can see from our traffic results above, we’re still in the infancy stage of building our YouTube audience and we’re not driving much traffic yet. We’re confident YouTube will pay dividends in the long run and once we have proven results you can be sure we’ll share our best performing strategies. We also hired someone on Fiverr to create a professional intro and outro for our YouTube videos. Trevor customized the clips with some awesome music and the finished product turned out amazing. You can check out the intro in the video below. In an effort to grow our organic search traffic we have become very strategic about the content we create. Instead of writing content on a whim and crafting a catchy headline, our process now begins with detailed keyword research. Then, we develop our blog content and blog post headlines around the keywords we want to target. We began this SEO-focused approach in November and it has already paid off. Take a look at our organic search traffic in January compared to October. Another SEO strategy we implemented last month was to build an RSS syndication system using IFTTT. This one was all Trevor and it’s still in the testing and build-out phase. He created a recipe in IFTTT that triggers when we publish a new blog post. The post is then automatically syndicated on all of our other channels like Tumblr and Weebly. He’s hopeful to have it fully built out in the next month or so and once it’s up and running we’ll share a blog post and a training on how to build it for your own website. In December and January, we invested a fair amount of money in Facebook ads and Pinterest Promoted Pins. We did this for a couple of reasons. First, we launched my 2018 Social Media Content Calendar which is very time-sensitive. We wanted to drive as much traffic to the calendar as we possibly could in December and January and paid ads were the quickest and easiest way to generate more traffic. Second, we wanted to run more tests with paid ads and try some new strategies we’ve learned over the past year. We plan to share the results of our tests into future training programs. We kind of see ourselves as your personal guinea pig. We spend the time and money testing new strategies so you don’t have to! Take a look at the screenshots below to see the results of our paid ads from January. The first screenshot is from Pinterest. We promoted four different pins to a variety of cold and warm traffic sources. Those pins generated almost 150,000 impressions and 810 clicks to our website. The next screenshot is from our Facebook ads. We ran one video campaign to warm traffic and one blog post to cold traffic. Our goal with each campaign was to get clicks to our website or landing page. Both ads performed very well and resulted in a total of 803 clicks. Overall, we were very pleased with the performance of the paid ads and plan to run them again when we have another product to promote. A recap of our first year of blogging, our 2018 goals, and our traffic sources and strategies from January. I dropped a ton of information so I highly recommend saving this post to Pinterest so you can read it again later. I hope you found this post helpful and discovered some new ideas you want to test on your own blog. If so, I’d love to know. Please share in the comments below your greatest takeaway from this blog post!